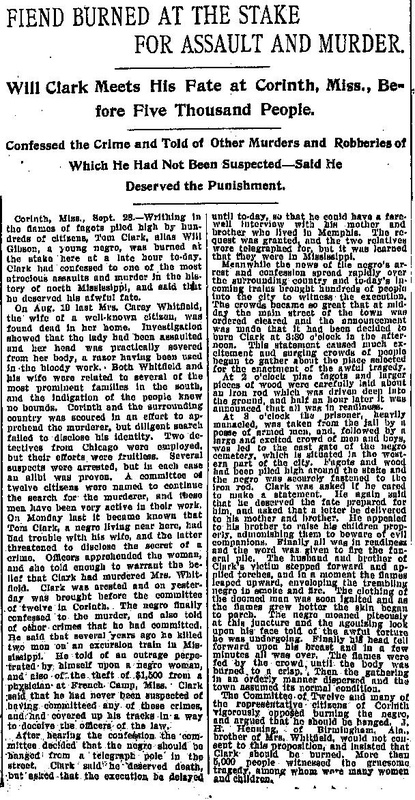 Killed on September 28th, 1902, in Corinth, MS. Clark was burned to death in a spectacle lynching, reportedly witnessed by as many as 5,000 people. Despite the full awareness of police, prosecutors, judges, the mayor, and other local leaders, no one was punished for participation in the lynching. Details of this case are discussed in the New Orleans-based Times Picayune, September 29th, 1902 (click on the image below and zoom in to read).